Northern Gannets are large birds about 1 metre long with a wingspan of around 1¾ metres. The Pelecaniformes is a (possibly invalid?) order of medium-sized and large waterbirds found worldwide. are monogamous. The young are altricial, hatching from the egg helpless and naked in most. They lack a brood patch. There are six families in this group, each one genus and all together 67 species. This bird is a fast and powerful flyer but its short legs and large webbed feet make it awkward at landings and take-offs. Sula Sgeir in the North Atlantic. the south coast of Africa and in Tasmania and New Zealand. 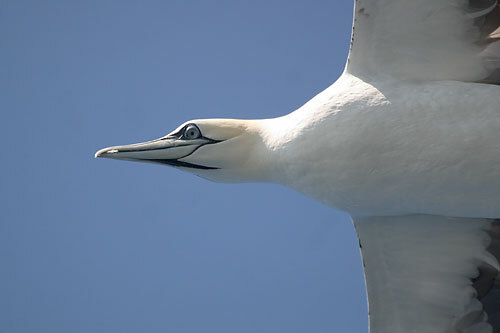 Adult gannets have dazzling white plumage except for narrow grey spectacles and jet black, tapering wingtips. During the breeding season, the head and neck assume a delicate saffron yellow tinge. The eyes are an icy blue, and the bill is blue to grey-blue. the nesting birds. 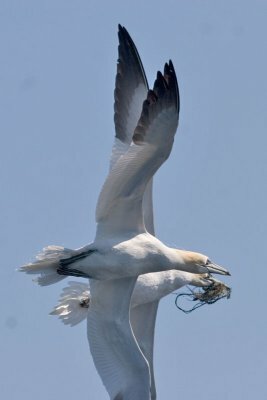 If disturbed, gannets will often desert their nest, particularly if they are nesting for the first time. gannetries were probably abandoned in the 19th and early 20th centuries because lighthouses were built on them. 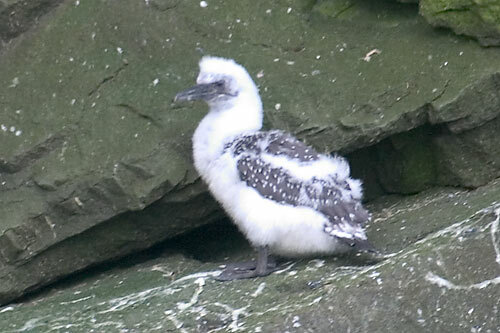 Its short legs and large webbed feet make the gannet a slow and clumsy creature on land. A fast and powerful flyer, it is nevertheless awkward at landing and taking off. 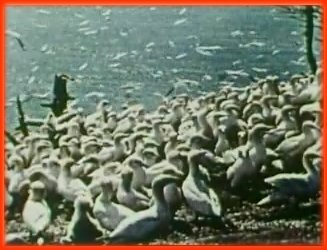 The Gannet breeds in large colonies on the coast and islands of north-west Europe with a few colonies in North America around Newfoundland. When not breeding, they spend their time out at sea in the North Atlantic and south to waters off West Africa. and depresses the tail. 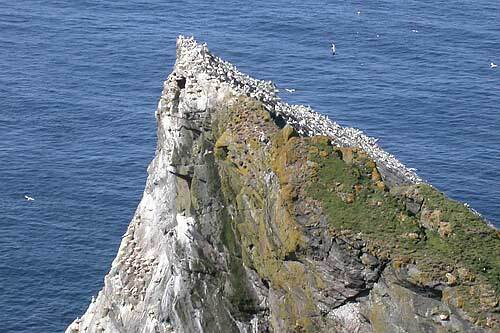 With weird moans it waddles and hops its way toward the cliff edge or a less crowded part of the colony. Each time it passes too close to a neighbour, a furor is created with many a bill thrust and vocal threat received. Using both legs and wings, it rushes ahead and becomes airborne. 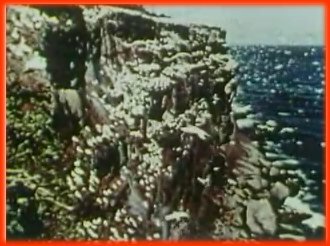 there are 22 Northern Gannet colonies, for a total population of 189 700 pairs. of 2 300 pairs. 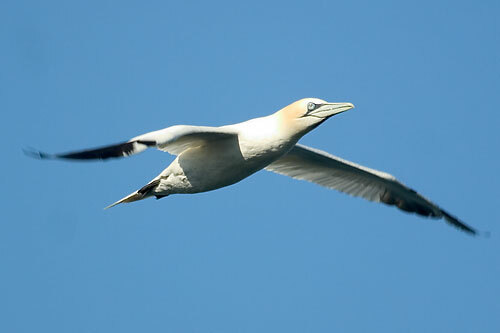 There is also a gannet colony in northern France, with 6 000 pairs. A nestling or "guga". Eggs and gugas were a major source of food for islanders such as the St Kildans in the recent past. with partially folded wings and great speed. Its impact with the water may send spray as high as 3 m, and the momentum of its dive is thought to carry the bird below its prey. Swimming strongly with the aid of its large webbed feet, and possibly at times with its wings, the gannet captures its prey. and they fly to investigate. On seeing a large shoal, they attack in great numbers.